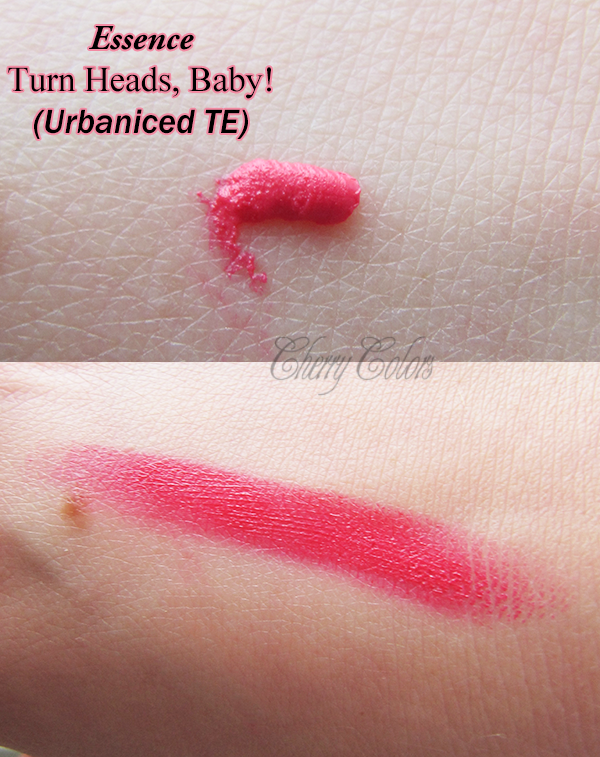 Swatch & Review: Essence Urbaniced TE Lip Cream (Turn Heads, Baby!) 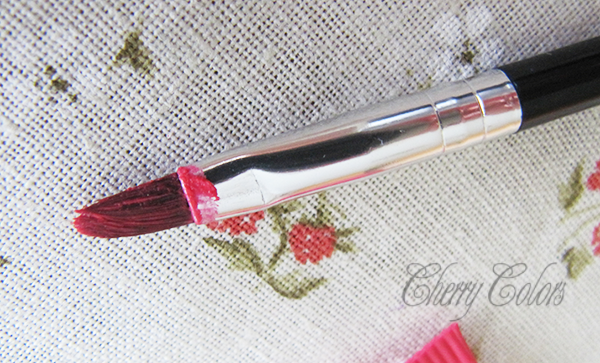 - Cherry Colors - Cosmetics Heaven! I must be honest with you, it's been a while since I saw an Essence TE and wanted to have something from it. But when I walked in our local Muller last week, I wasn't prepared for what I saw. 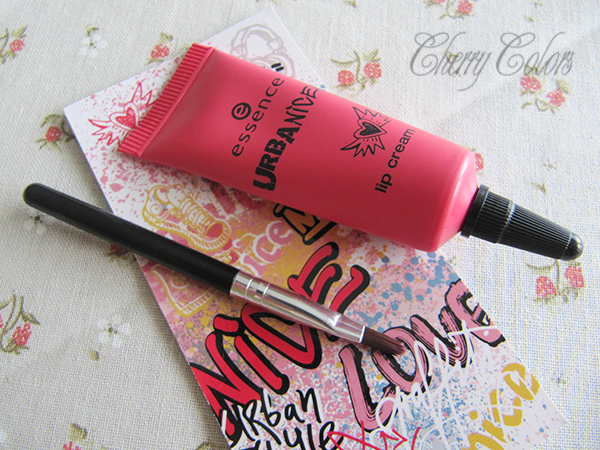 I saw a full UrbaNiced TE and what shocked me was that I didn't know there would be a lip cream in it. I thought I saw enough previews of the collection so I should know what's inside. Yea right. I tried to frantically search for swatches since there were no testers available in store. I found none. None! And in my tiny disappointment / anger I purchased it. Only after I purchased it I found TWO lip swatches on Instagram. First thing I did when I got out of the store? Swatch this baby!! It's very soft and a bit silicone like (those silicone based primers, you know?). It smells lovely of vanilla and spreads easily. I was very excited to see that's absolutely packed with pigment. Super pigmented! With it comes a tiny lip brush wich is fine, nothing special or wrong with it. I also got a tip from Jessie's Fairytale - to use my finger to apply the cream. It works wonderfully, especially if I want to get a more natural, less packed look. I like that you get this cute card with your tiny plastic pouch. The pouch is easy to open and use, so I think I'll be carrying my lip cream + lip brush in it. Opening and using it may be a bit time consuming, or not (depending if you use the brush or your finger), but I think it's very travel-friendly. Here are my bare lips. They are losing the defined edges with age (? ), which is quite annoying but I guess there's nothing I can do about it. And with the lip cream in Turn Heads, Baby! The feeling right after the application is a bit drying. 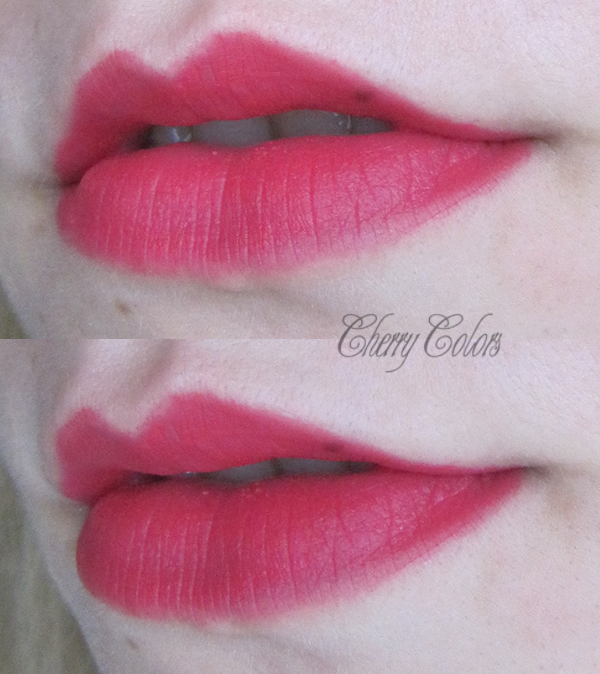 Like most matte ending lip things, but it's not really bothering. 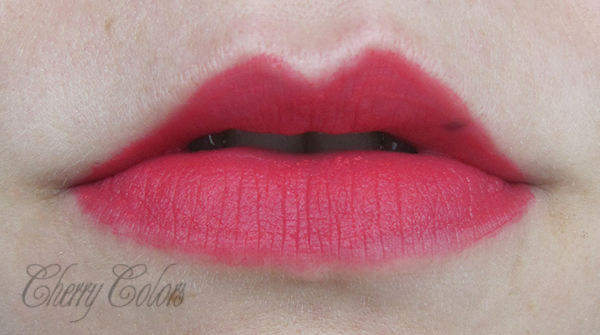 The lip cream dries matte and is a mix between red and fuchsia color which is totally flattering on all pale girls ;). The lasting time is ok - once it's dry, it's dry and it won't move except if you are drinking a lot or if you are eating. So it should survive drinking, but it won't survive eating. Even when most of it goes off, you may be left with a nice stain. It really depends on how much you did eat or drink. This is my very first lip cream and I am happy with my purchase. The staying power is better than most lipsticks and the color suits me well. I like that you get for the price a brush with your lip cream. I am a huge fan of matte products and am happy this one is now in my collection. I do recommend this product to all the matte lipstick lovers and to all those that want to try a new fun lip item. It would get 5 full hearts if it survived eating, but it's still pretty good for me!